Shrouds of the Somme – The TrenchBetween 29 September and 14 October 2018, an evocative part of the Shrouds of the Somme exhibition visited the historic Filton Airfield in South Gloucestershire*. ‘The Trench’ is part of the Shrouds of the Somme artwork exhibition commemorating 100 years since the end of First World War. The exhibition has been touring the UK and will visit London to be exhibited at Queen Elizabeth Olympic Park in November. 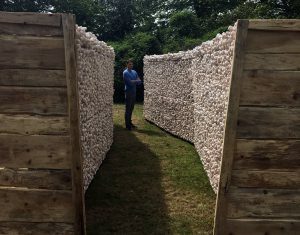 Shrouds artist Rob Heard has built a 2m high free-standing wooden trench in which the tens of thousands of Shrouds are stacked. Visitors walking through experience the immersive nature of this installation; it generates incredibly powerful emotions, giving a graphic sense of both being in a trench and what the large numbers of those killed really mean. Names and details of all 72,396 Commonwealth servicemen killed at the Somme who have no known grave are displayed on the outer walls of The Trench in alphabetical order, sourced from Commonwealth War Graves records. *This exhibition has been brought to you by South Gloucestershire Council, hosted by Aerospace Bristol and with support from SSAFA Bristol & South Gloucestershire, Airbus, YTL, DHL and the Commonwealth War Graves Commission.